TOKYO, Oct. 22, 2018 – Mary Chocolate Co., Ltd., a Japanese confectionary manufacturer and seller founded in 1950, will run a booth to display its brand “Tokyo Chocolate” at “Salon du Chocolat Paris,” the world’s largest chocolate exhibition to be held from October 31 to November 4, 2018. Fukuoka prefecture start a campaign using “Tonkotsu Ramen (Hakata Ramen)”, one of the three big ramen (Kitakata Ramen, Sapporo Ramen and Hakata Ramen) in Japan, aiming to expand Fukuoka’s gourmet to the world. Tonkotsu (based pork bones and other ingredients) Ramen is also referred to as Hakata Ramen, which is originated in Fukuoka Prefecture. TOKYO – The Washoku World Challenge is a cooking contest in which Japanese cuisine chefs from all over the world compete in technical expertise and passion for Japanese food. The contest, in its 6th year, is organized by the country’s Ministry of Agriculture, Forestry and Fisheries, for non-Japanese chefs. TOKYO – Keio Plaza Hotel Tokyo (KPH), one of Japan’s most prestigious international hotels located in Shinjuku, Tokyo, will host the “Princess Mermaid Sweets Buffet” in commemoration of the fairy tale written by the Danish author Hans Christian Andersen at our All Day Dining Restaurant “Jurin” from July 1 (Sunday) to September 30 (Sunday), 2018. TOKYO, Oct. 16, 2017 – “Taste of Japan” is a website facilitating the dissemination of information on Japanese restaurants and cuisine culture worldwide, including details on Japanese restaurants all over the world, recipes for staple Japanese dishes, and explanations of signature Japanese ingredients. SANDA, Japan, Sept. 28, 2017 — Susumu Koyama, owner and chef of “Patissier es koyama” in Sanda city, Hyogo Prefecture, western Japan, will announce a new selection of chocolate products titled “SUSUMU KOYAMA’S CHOCOLOGY 2017″ at the world’s largest chocolate exhibition, Salon du Chocolat 2017, that is scheduled to kick off in Paris on Saturday, October 28. Tokyo Wagyu Show is a 5 day event being held from 19th October to the 23rd October 2017 at the Komazawa Olympic Park in Tokyo, Japan. This event showcases Wagyu products and provide Wagyu foods. Wagyu is selected from four type cattles such as Japanese Black(Kuroge-shu), Japanese Shorthorn(Nihon Tankaku-shu), Japanese Brown Cattle(Akage-shu) and Japanese Polled(Mukakuwa-shu). TOKYO–About the Washoku World Challenge: The Washoku World Challenge is a cooking contest in which Japanese cuisine chefs from all over the world compete in technical expertise and passion for Japanese food. The contest, the 5th of its kind, is organized by the country’s Ministry of Agriculture, Forestry and Fisheries for non-Japanese chefs. “The 9th Agri-food Expo Tokyo 2014″ is domestic farm products trade show and it will be held for two days in Japan. This show helps in the development of the agricultural sector and also presents opportunities to the food producer and processing companies to connect and interact with each other. The Japan External Trade Organization (JETRO) will present the Japan Pavilion at the Summer Fancy Food Show 2013 in New York City from June 30 – July 2. 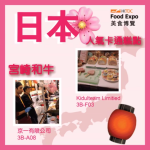 We will feature respective vendors from Japan with their prideful high quality products and regional specialties. Products on display range from Yuzu products, green teas, artisanal pure sesame oils, Mentai caviar and more. They were meticulously chosen for their quality, rarity and health conscious products, some of which are making their international debut.